Designed to provide a rich mobile computing experience, the new device combines a laptop-style clamshell form factor with dual touchscreen technology, creating an intuitive, easy to use and stylish device that enables users to utilise their content in a number of different ways. 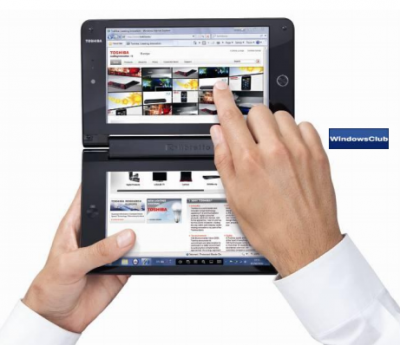 The world’s first dual-screen laptop to be powered by Windows 7, the Libretto W100 features two 17.8cm (7”) touch-sensitive screens, providing a unique interface on which to enjoy web and computing applications. Simple to navigate and easy to use, Windows 7 utilises the W100’s dual-screen technology to the fullest extent, allowing users to navigate menus, run applications side-by-side and interact between applications by easily dragging content from one-screen to another. Powered by Intel Pentium technology, the Libretto W100 features 2GB of memory, has size – 202mm x 123mm x 30.7m, weight – 819grams, Battery life – up to 3.5 hours and runs Windows 7 Home Premium Operating System. The Libretto W100 will be available from late summer 2010.